EDIT: Hey, long time no see. Photobucket imploded, so I've tried my best to replace all the images. However, I've lost track of some of the WIP versions, so they may not all be the exact versions they were before. 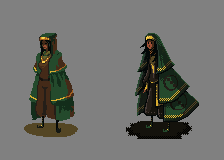 Hey, I'm actually brand spankin new here, and to pixel art in general. I see a lot of really talented people here, like holy moses, be still my beating heart. It been pretty fun looking through all the threads, so I thought I'd post my own work here. Anyway, my personal project is to create all the artwork for a game. It's an adventure of sorts through an endless forest. I have juust enough assets to create some basic scenes, but I'll be here awhile. I'm using oversized tiles (64x64). It might be a little strange, but I was shooting for something that'd look nice on my poor 10 inch screen and also my massive 19inch screen. 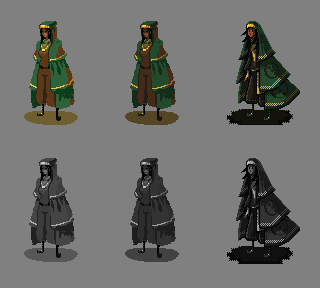 Anyway, through making these I'm starting to understand that pixel art has it's own unique challenges. This is my demo image. 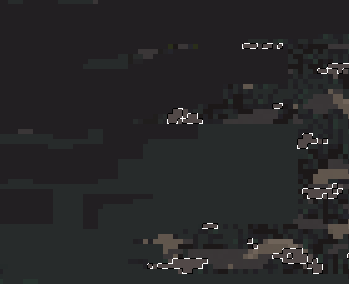 I haven't made tiles for dappled light yet, and the branches are sort of set in their approximate positions (I just spotted some runaway dither in the branche's shadow), but this otherwise shows how I hope all these tiles will work together. Player character. There's going to be so much regret when I go to animate her. Water has been my latest attempt. These are animated to look like a swiftly running stream. I'm planning to make some different animations to go with still water, and a later a lake. It's so hard to find examples of animated water tiles. Seeing how I could tile it. Seems pretty versatile so far. I do need to go back and make a couple new tiles. This water still needs some work though. Maybe I should draw the trees reflection on it? In any case, the tree trunks are certainly glowing bright. Then there was this stupid thing. They almost work in small doses, but tiled it's a little bit eye watering. This is still very much a work in progress. 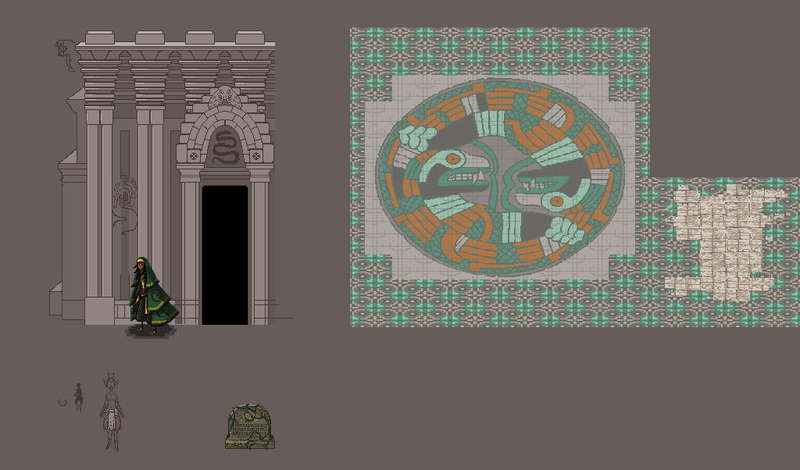 I just may be a little bit too pleased with how that snake temple it turning out. Going to try something later to make the curves look smoother. I think that's it for now. I'm working at them in a random fashion. Maybe I'll do more trees next, or sprites, or who knows? Your trees have too much highlight on them. In a forest there would only be patches of light getting through. Even so, highlights of that much contrast should be reserved for things you want to draw attention to. Right now they are competing for attention with your sprite. Roots on big tree are too small and obvious repeats, try going for bigger unique roots that connect to the ground better by having some lumps of dirt and grass etc. Also let the structure of the roots blend up into the lower trunk. Use light and shadow to achieve this. You need a darker colour for shadow on trunk and make the shadow area larger. Your sprite is pretty cool but try increasing its brightness a bit to help it pop out from the background. Your leaves look pretty good but now you need a few transition tiles rather than such a hard edge between grass and leaf. 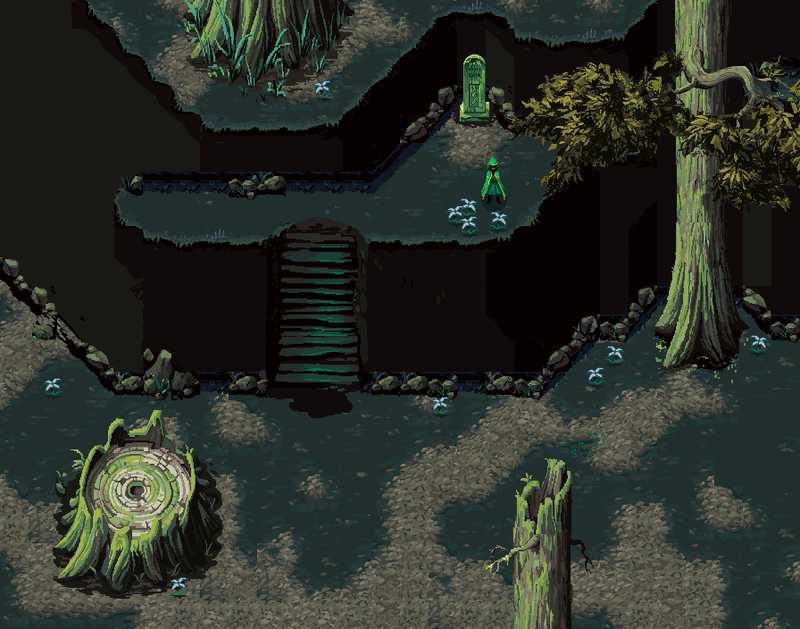 You also need some 2 or 3 tiles of grass with just a few leaves scattered around in random positions, and then scatter these tiles around the scene. 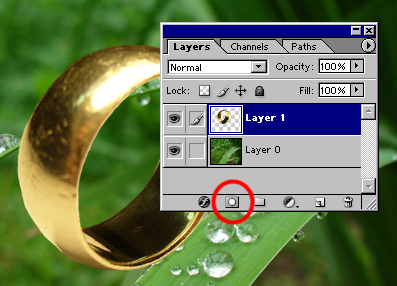 Dunno what software your using but in Photoshop for example you can cheat (just a shortcut really) to do this by placing the leaves on a layer above the grass tile, then press the Layer Mask (see screenshot below), then paint black to make rub out the leaves, or white to add leaves back on top. Always use Pencil mode with no opacity etc so you don't ruin ur pixels. Also with placement of your leaf tiles in your mockup, there's too many straight edges along the same angle that suggests some kind of oblique perspective. 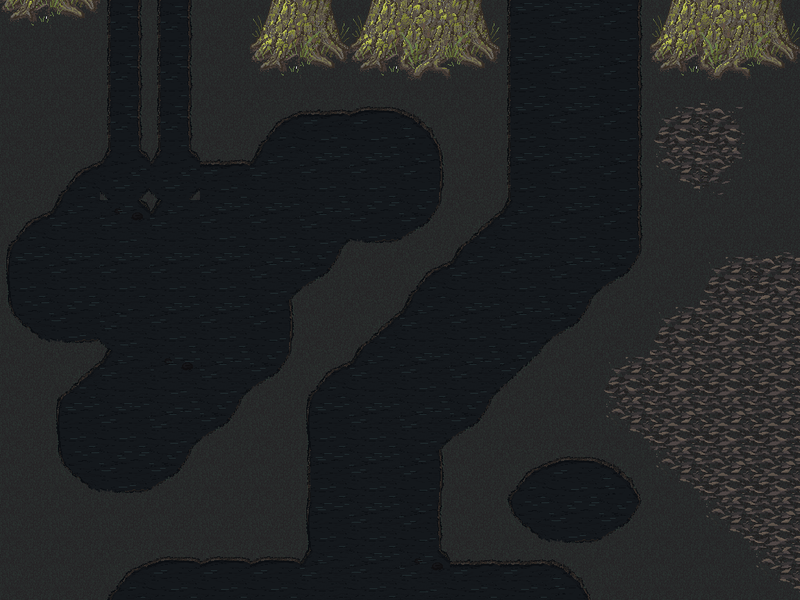 So again, rough up the edges of your transition tiles and avoid so many straight lines. 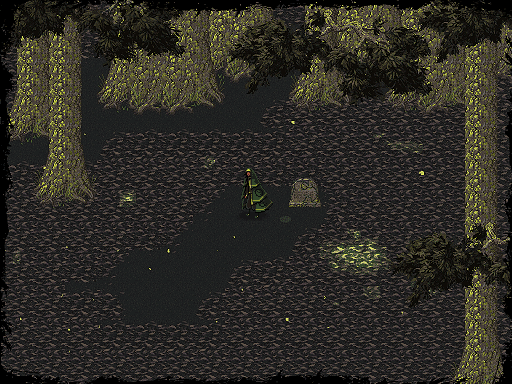 If your going to have THAT much leaf tiles, you need some variations within the leaves too. This could be some small piles of leaves and patches of grass, sticks etc. The edges of your water are too thin and too straight. Try varying the thickness to make it more natural. If your not already, try starting by roughing things out more rather than jumping into detail level. Your temple has no perpsective compared to what we'd expect from the rest of the tiles. Read up on RPG standard 3/4 view. Pixel art is not for big resolutions. It won't look nice, even if you spend infinite amount of time on creation.
? I disagree. It will be a lot of work depending on how much he wants to do, but "It won't look nice even if you spend infinite amount of time" is not true. Disagree with Sohei as well. Highres pixelart can certainly work well if done right. What I would suggest to you is using no antialias and no dithering alltogether. Go to the General Discussion forum and look for the Ramblethread by Helm. That thread has really good info on cluster usage. What you should really do is try and keep things less noisy, make things read as what they are intended to be. Also don't shy away from more contrast. Atm everything is pretty much in the middle of the value range, nothing really light, nothing really dark. Play with the contrast a bit. There's a lot more I could do to it, but I didn't want to look like I showed up here and then dropped off the face of the planet. 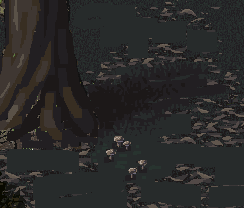 I could have made more edits to the dead leaves, but got distracted by making tiny mushrooms instead of variant tiles. The current tile set. I haven't done anything with the second tree, cause it blends right into the background, but I might fiddle with it later. The tree could likely use a few passes to smooth out things, and reduce a lot of needless noise. The feel of it though is nice though. Decroded, your critiques are awesome! I'll be working through the rest of them too as soon as I can. But I did think about that for awhile. 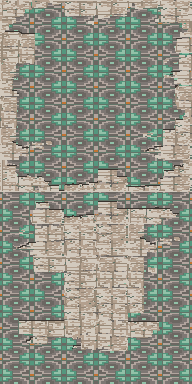 Here's what the game would approximately look like if the tiles were 32x32. So tiny. It's kind of adorable, and games can look brilliant at this size, but it's not what I'm going for. 64x64 is really only twice as big anyway. Ptoing, reducing noise would probably be fantastic. Eventually I'll get that poor tree looking less like a pixelated mess, and more like a pixelated tree. Looks like I have plenty to work on now. I'll come back when I get everything polished up. You got way too many colours, especially in your greeny yellows. Some are grouped way too close together while some are too far apart for nice blending. You can get away with dithering but really why bother? Because I kinda use the Magic Wand for loose painting, having SO many colours is a hindrance. Smoothed out trees and started building some form. Added soft shadows from the trees with a short fall-off so you can put other stuff in the next tiles instead of worrying about big long shadows. Randomly roughed up the edges of the leaf patches. Removed noise around mushrooms and added some shadow so we can see them better. Flatten the stone and add light and shade to define the planes of the form, with selective highlights disrupted to suggest texture. Did this with your existing palette but would swap some of the colours around myself. I'd rather live with flat grass than have all the single pixel noise texture so I'd flatten it to 1 colour. If you want to imply grass you could rework the image, add some patches of longer grass vs shorter vs dirt, and then use edges between textures and edges of shadows to imply your grass texture rather than struggling to draw every blade across the screen. She's interesting but could be drawn much simpler. I didn't mess with the colors much. You may want to try tweaking them a bit. There's going to be so much regret when I go to animate her. Just do it in passes. Your character design is really way too close to Journey's one. Just a cloaked character with a bit of a triangular silhouette, not that close IMO.